If you’re wondering how to help communicate effective change management within your organization or how to communicate organizational change, our webinar recap on disruption is perfect for you! Disruption is all around us! We are living in a digitally chaotic world. It’s pretty noisy out there! Which makes it harder for internal comms pros to cut through the noise and communicate with impact! We partnered with Inner Strength Communication to help you create effectively communicate change within your organization and equip your with some useful change management strategies. 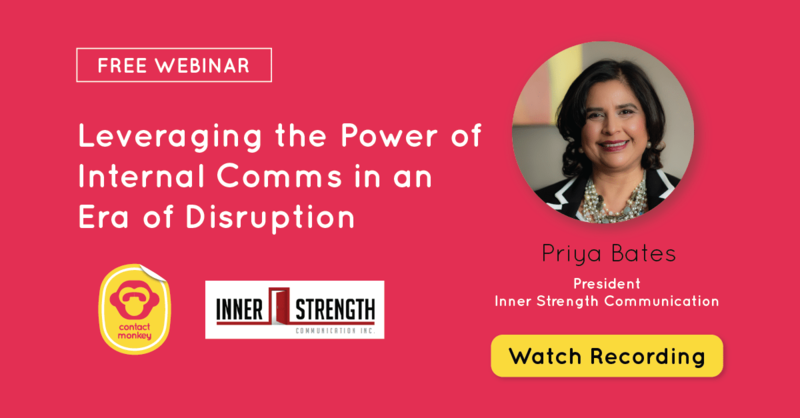 During this live webinar, award winning communications professional and President of Inner Strength Communication, Priya Bates, highlighted some key tips to communicate change like a pro and take advantage of disruption. And if you’re suffering from a severe case of FOMO right now in case you couldn’t make it to this epic live session, have no fear. I’m here to give you some key takeaways so you know how to communicate in an era of disruption. Priya explained that organizations typically go through two types of disruptions: evolutionary and revolutionary. Small changes that happen over time are evolutionary changes while bigger disruptions are revolutionary. A lot of the times executives are aware of what types of disruptions are about to hit an organization so they view even big disruptions as evolutionary. “But when they finally decide to tell employees what’s happening, they feel like they’re going through a revolution,” Priya explained. It’s no wonder then that there’s often a big disconnect between executive leadership and employees at many organizations. It’s clearly a communication problem! We also asked our attendees what percentage of disruption that they’re communicating within their organizations is revolutionary. We had a range of answers with 62% of attendees claiming that 25% of what they’re communicating right now is revolutionary. Priya went on to elaborate that today’s rate of disruption is faster than ever before due to advancements in technology. It initially took 38 years for 50 million people to adopt radio and accept this disruption within their lives. This rate of acceptance towards disruption keeps going down over the years. As you can see in the visual below, it took 13 years for people to adopt TV as a normal disruption in their lives while it only took 35 days for them to become receptive to the Angry Birds app! It’s therefore pertinent to keep up to date with technological changes. “What role are you playing in influencing conversations and enabling people to be ready for the changes that are going on?” Priya asked. Really good question to ponder over, isn’t it? Priya went on to explain what kinds of change organizations go through. Usually, disruption happens when leadership changes or when new technology is implemented or there are changes in regulation in highly regulated industries. “In most cases, change programs fail either 50% of the time or even 75% of the time. It’s because we don’t communicate effectively,” Priya stressed. She elaborated that there are 6 reasons why change programs fail. Failure occurs when effective communication hasn’t taken place regarding the change management. Sometimes decisions are made at the top and not communicated properly to the employees. Priya observed that organizations are recognizing that internal influencers can also play a role when it comes to communicating change or disruption. Unclear objectives and lack of performance measures are also core reasons why communicating disruption effectively can fall flat. “We see communicators who simply communicate for communications sake and send out the newsletter and the messages and tell the stories but they don’t actually measure the results and fail to connect these with business results,” Priya emphasized. The last reason why disruption isn’t communicated effectively is because change is emotional and more often than not, this isn’t taken into account. We’re all humans and so are our employees and we all react to change and disruption emotionally. The above visual aptly shows us what the change path looks like for anyone going through disruption. You first go through shock, then there’s denial, anger and often resistance. This is followed by acceptance, adoption and then commitment that this is happening and there’s nothing else to do other than commit to the cause. It’s important to understand that this change path is a trail every single individual goes through and it’s completely normal to react this way. Having knowledge of the change path helps you manage your messaging and communicate disruption effectively. Ever wonder what role, you, as an internal communicator, play during times of disruption? According to Priya, the communicator plays an integral role in bringing the point of view of the stakeholder to the table. As an internal comms professional, you create and help leaders communicate clear and consistent messages. You also play a powerful role in helping audiences become aware that change is about to happen, enabling them to understand, respond and ultimately believe in the change. As an internal communicator, your job is also to listen, ask questions and get the stakeholders involved. You should then create a plan that provides the right message to the right stakeholder at the right time. “It’s really important about how we communicate so we get people to listen and they get the information in a targeted fashion that’s relevant to them,” Priya explained to our engaged audience. Priya often talks about her five “I’s” for successful communication. She emphasized what each of these mean during the live webinar. Most of the time, communicators are working at the implementation stage, which often involves updating the intranet or creating newsletters. But where internal communicators really need to play a vital role is during the “interaction” stage. This involves knowing what your audience wants, getting to know employees and understanding the nuances. The “integration” stage involves taking a bunch of disparate things and bringing them together so it all makes holistic sense. It’s important for communicators to make people aware of what’s happening. You also need to make them understand why the disruption is taking place. This involves giving them more information on why this disruption or change is the right decision for the organization. You need to have a strong understanding of what to do with the information you have. You also need to help them believe they can adopt and commit to the change or disruption about to happen. We’ve talked a lot about disruption so far, haven’t we? But how do you truly leverage the power of disruption and use it to communicate like a boss? Well, Priya Bates gave us concrete examples from her own career, highlighting how she turned organizational disruption into key opportunities to communicate and engage with employees. In 2012, Loblaw Companies Limited chopped 700 head office jobs, as reported by the Toronto Star. Priya Bates happened to be there while this disruption was occuring. She worked hand in hand with HR and executives to prepare and communicate these changes effectively. To this day, Priya believes that the companies she’s worked with are flourishing and consistently being named as top employer companies due to their devotion to internal communications. Priya also led the rebranding of International Association of Business Communication (IABC) in 2015, helping create a new set of values, messaging and visual identity for the organization. The fact that no one has ever questioned the rebranding efforts after the launch of the new IABC is a testament to how significant it was to lead this disruption in the first place! Communicating disruption and organizational changes effectively is integral because without communication, people will wonder what’s happening or they may make up their own truth. They may get scared and leave or they might get scared, stay and stop performing! And that sounds much worse, doesn’t it? “Having a communication infrastructure in place during the good times will help a company during a change and crisis and also build trust,” Priya emphasized. Definitely sounds like something we all need to frame as a quote on our walls. It’s the mantra we communicators need to live by! Are you ready for disruption? We conducted a live poll during the webinar, asking our audience to vote on whether they’re ready for disruption or not. And guess what? 65% of our audience voted they’re ready for disruption! That’s certainly a cause for some celebration, isn’t it? Jonah Hill certainly thinks it is. But what does it mean to be ready for disruption? It means you need to let go of the tactics to focus on the strategy. It also involves embracing technology and adopting disruptive tools that allow you to prove your value. You need to know how to measure the impact of everything you’re communicating and be able to make sense of your internal comms metrics. Unfortunately, many organizations don’t invest in internal communications. Which is why Priya founded Inner Strength to help organizations communicate and conduct engagement audits, provide strategic communication training and help make the case for change. Inner Strength Communication can also introduce your company to technologies that will enable your workforce and provide additional support when you’re going through a major disruption. So, with all the above knowledge, are you feeling empowered and ready for disruption? Still need more convincing? Check out the recording of the webinar via the video below. Ready for change management? Want to learn how to track your internal comms using ContactMonkey? We can set up a personalized demo for you and your team. Just click on the button below to book your demo!